He thinks nothing of it and is about to shoot when he hears, "Ribbit. 9 Iron"
He looks at the frog and decides to prove the frog wrong, puts his other club away, and grabs a 9 iron. Boom! he hits it 10 inches from the cup. He is shocked. He says to the frog, "Wow that's amazing. You must be a lucky frog, eh?" The frog reply's "Ribbit. Lucky frog." The man decides to take the frog with him to the next hole. "What do you think, frog?" the man asks. "Ribbit. 3 wood." The guy takes out a 3 wood and Boom! Hole in one. The man is befuddled and doesn't know what to say. By the end of the day, the man golfed the best game of golf in his life and asks the frog, "OK, where to next?" The frog reply's, "Ribbit. Las Vegas." They go to Las Vegas and the guy says, "OK frog, now what?" The frog says, "Ribbit Roulette." Upon approaching the roulette table, the man asks," What do you think I should bet?" The frog replies, "Ribbit. $3000,black 6." Now, this is a million-to-one shot to win, but after the golf game, the man figures what the heck. Boom! Tons of cash comes sliding back across the table. The man takes his winnings and buys the best room in the hotel. 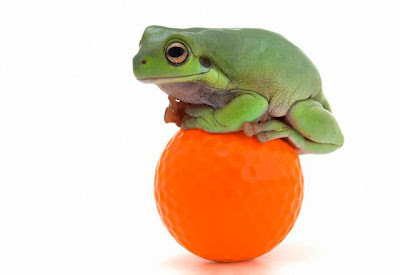 He sits the frog down and says, "Frog, I don't know how to repay you. You've won me all this money and I am forever grateful." The frog replies, "Ribbit, Kiss Me." He figures why not, since after all the frog did for him he deserves it. With a kiss, the frog turns into a gorgeous 15-year-old girl.